I saw a sliver of time and I took it. 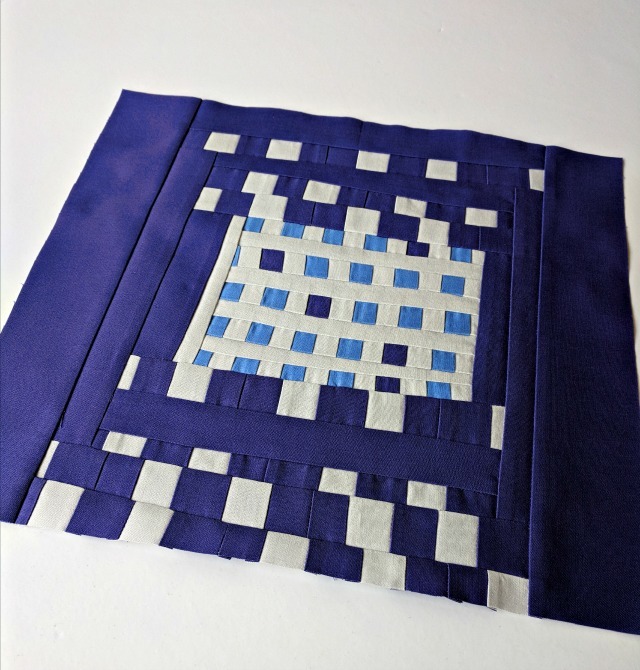 After reading a friend's post about her Ultra Violet project, I commented that I hadn't had the chance to join in the 2018 Pantone Quilt Challenge: Ultra Violet Edition. My focus has just been elsewhere, I guess. But the challenge, hosted by Sarah/No Hats in the House and Rebecca/Bryan House Quilts is a bit of a tradition for me, and when I realized I wouldn't have access to my sewing machine during much of the time between now and then, I set everything aside and did a bit of reward sewing. You know - the kind where you got your chores done and then you get to play! Luckily, I had a yard of Kona Bright Peri on hand in preparation for this moment, so I curated a few other solids from my stash and started in. At first I was thinking something with improv dots in varying densities, then somewhere along the line I got caught up in the idea of an improvisational courthouse steps design. It's kind of funky, a bit oddly shaped, and with the shortest side being under 30", it'll fit in the mini category. But though I'm just showing a progress photo here, the top is done, and I'll move right on in to quilting soon, glad for the chance to dabble just a bit and stick with tradition. Here's a link if you'd like to see my previous Pantone challenge projects. I'm glad you were able to carve out some time to play and I look forward to seeing how you finish it up! Love it! My bright peri is part of my color stack for Saturday - not guessing anything will be FINISHED in time, but then again you never know! Lucky you, to get play time! Ultra Violet is one of my fav. colors (don't tell the others) it has depth, richness and history.